1959, Starring Barbara Lord, Jack Bettis and Peter Falk. Directed by Julian Roffman. 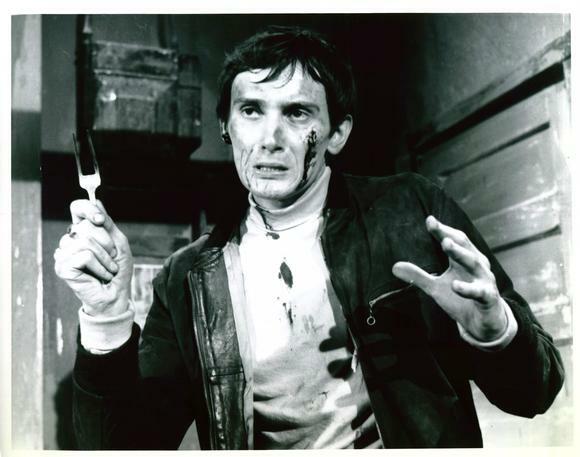 Although director Julian Roffman is probably best known for his excellent 3-D horror film The Mask, The Bloody Brood was his first feature film. Roffman was a prolific NFB director during the war years, who went on to found his own company, Meridian Films. In the late 1950s Meridian partnered with famed exhibitor Nat Taylor's wife Yvonne to put together two early Canadian features with Roffman as the director. While The Bloody Brood is not as entertaining a film as The Mask, it is a superior genre picture with a distinctly Canadian twist. The Bloody Brood is the tale of thrill hungry beatniks, organized crime and a personal vengeance. Nico (played by a pre-disheveled Peter Falk) is the smooth talking mentor of a bunch of world-weary beatniks. Together they hang out at a coffee house/art bar, similar to the setting of Roger Corman's Bucket Of Blood, which was released the same year. Over coffee one afternoon, Nico and some fellow outsiders are waxing philosophical. An old man comes in the bar to deliver a newspaper to Nico, and promptly falls down and has a heart attack. In the final throes of his death, a couple of the panicked beatniks ask Nico what to do. He proclaims that they should enjoy the man's death as pure entertainment Kicks! Nico and his crew proceed to a house party, and here we get to meet some of the other beatniks as Nico tells the story of the old man's demise to the party guests. 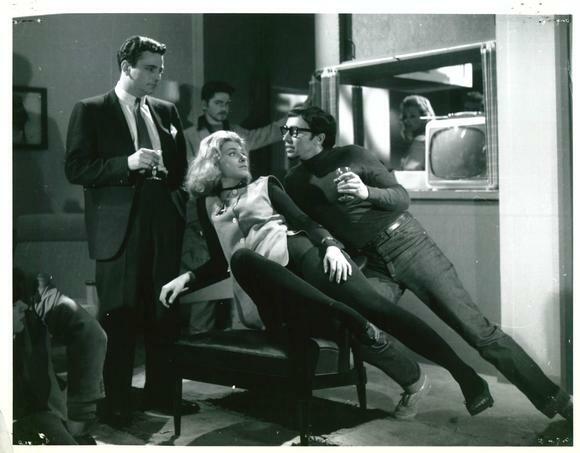 What immediately struck me as odd was the portrayal of the beatniks. Instead of being stereotypes, they are all young adults that have regular day jobs and hang out with Nico at night. Dave, who wears a black turtleneck, thick rimmed glasses and a goatee is the sole exception to this, but the other "beatniks" include Hanes, a TV commercial director, and an office girl named Brooke. 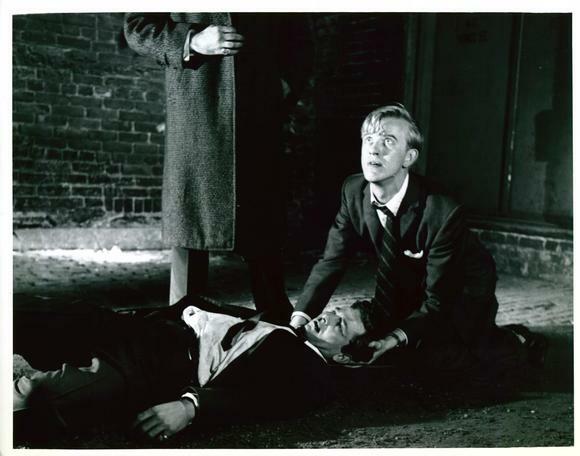 Later at the party, Nico tells his right hand man Hanes that "Death is the last great challenge to the creative mind," and that he wants to kill someone, to give their death meaning. Hanes nervously agrees to Nico's suggestion that he help "direct the real thing," and when a messenger boy comes to deliver a telegram to the absent owner, Nico invites him in for a bite to eat. Suddenly the picture changes its focus entirely to Cliff, a night school student studying in a small apartment. Cliff also happens to be the brother of Roy, the messenger boy. When Cliff gets a call from Roy complaining that his stomach hurts, the line (and Roy) suddenly goes dead. Cliff meets Officer McCloud (no, another McCloud) at the hospital where he learns that Roy was killed by "perforation of the upper and lower intestine." Cliff demands to know what happened, and McCloud reluctantly tells him his brother ate a hamburger full of ground up glass. Against police warnings, Cliff vows vengeance on the monsters who would do such a thing and goes out to the houses on Roy's delivery route to get answers. At the apartment where the party was, Cliff finds out that the owner of the house is out of town. As he is leaving, he runs into Dave, who tells him that Nico is house sitting and probably would know when the tenant would be back. He takes Cliff down to the coffee house to wait for Nico, and meet the others. Although Cliff tries to pass himself off as a beatnik, Brooke sees through him when she meets him, calls him a square and tells him to get lost. The next night at another party, Cliff finally gets Brooke to talk about the messenger boy, but they are interrupted. Finally feeling that he is getting somewhere, Cliff leaves to tell McCloud what he has found out. There's a reason why Nico doesn't quite fit in with the beat image-- he is part of an organized gang of drug dealers, just using the beatniks in order to sell them drugs. He is meeting with some fellow goons when Cliff shows up at the restaurant to confront the gangster. Nico plays it real cool until his cronies saunter by and pick a fight with Cliff. Nico kicks them out and apologizes to Cliff, but it is all for show-- Nico produces Cliff's pickpocketed wallet. On learning Cliff's full name, Hanes suddenly realizes that he is Roy's brother and starts casting nervous glances. 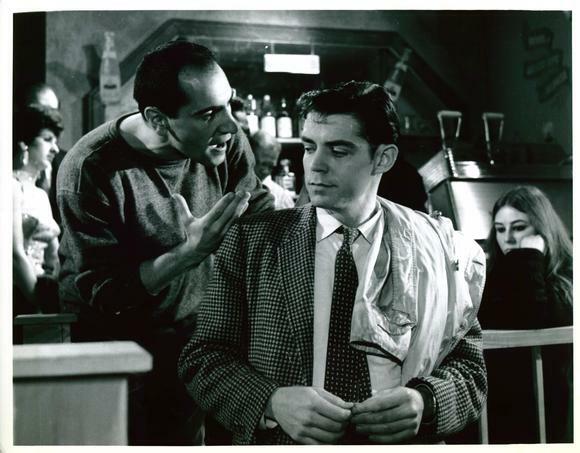 Nico tells Cliff that the apartment owner will be back in a few days, and that he should try back then. But it is already too late-- Cliff realizes that it was Nico who killed his brother, and upon leaving he confronts Brooke with the facts. She refuses to believe that Nico would do such a thing, but if Cliff can convince her, she agrees to spill her guts to the police. Now it is up to Cliff to expose Nico and the truth about his brother's death. This picture impressed me very much. 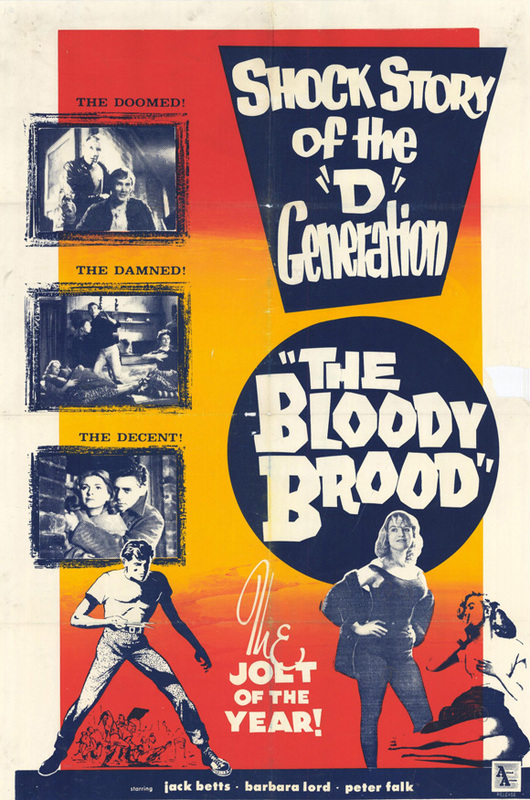 It was a well plotted film that didn't seem as "exploitive" as most juvenile delinquency pictures. Sure there's plenty of violence (mostly off screen), but the beatniks were not presented as outsiders or lawless hedonists. They are everyday people who just like going to a coffee shop after work. As Brooke tells Cliff when he asks her how she can work during the day and be a beatnik at night, "Well, I have to eat!" Like many other Canuxploitation films, Roffman chooses not to demonize outsiders from the mainstream, those who choose to live their lives in a different fashion. If Pete and Joey can find comfort in a displaced Maritimer community in Toronto in Goin' Down The Road, then the apathetic youth can go to a coffee bar to philosophize with their friends. As with his other film, Roffman favours closed and claustrophobic spaces. However, The Bloody Brood lacks some of the more atmospheric tones of The Mask. The shadows on the wall are obviously produced by studio lights, and while there are some cool bongo solos, the score does little to enhance any tension in the film. Ultimately a less sophisticated film than The Mask, The Bloody Brood is nonetheless a very well plotted and acted film that is better and less judgmental than most "beatnik" movies.